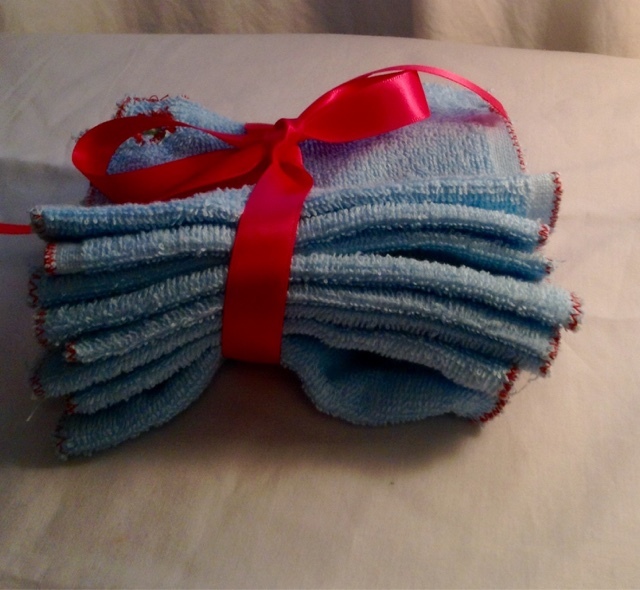 Mother's always say the commercial washcloths for babies are not very nice, are made of synthetics and turn a dingy color, or are not absorbent and don't always stay soft. 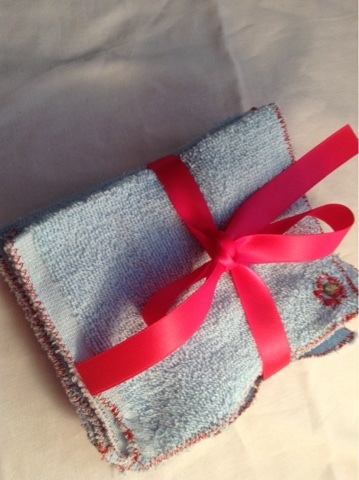 There is also a big difference between cotton Terry-cloth (toweling fabric) bath robes and the synthetic plush ones. The synthetics just don't feel good after a shower because they don't really absorb moisture, they tend to trap it. It is very hard to find cotton terry cloth bathrobes. 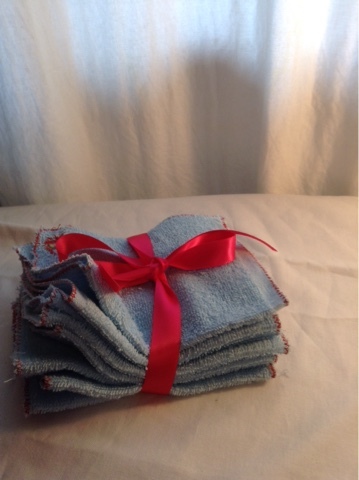 Someone here commented you could make one out of towels but I have not attempted it yet. It would sure save a lot of trouble with the sewing, since the fabric shreds, gets caught in the feed mechanism, and is hard to unpick when you make a mistake. The seams all need to be over locked. 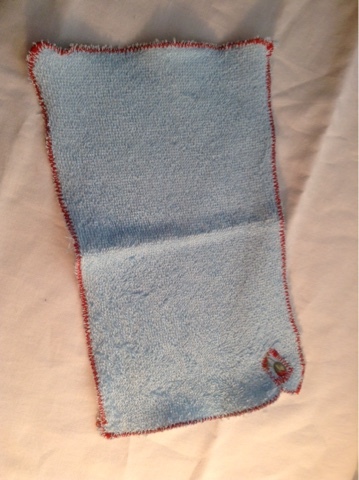 The people I have made these wash cloths for, even 5 years ago, say they are still using them for their children. These are for the basket in the previous post, to the lady who is having a girl. And then cutting the cloths along the folds. I then turn the dial on my machine to a satin stitch and stitch around each cloth, maybe twice, to keep it from shredding. It does use quite a bit of thread but I stitched twice all eight of these and still have a generous supply of thread on my spool. I appliqued a little rosebud from another fabric just for an accent. There will be more sewing to show you, soon. As I have been sewing for other people, I sometimes forget to take pictures of the finished product. 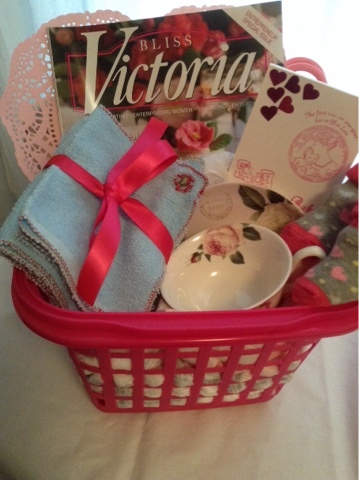 Here is what the gift basket looks like so far. I only have a couple more items to add. A word of caution about sewing for other people, or doing for others in general, when you also have a family to look after. 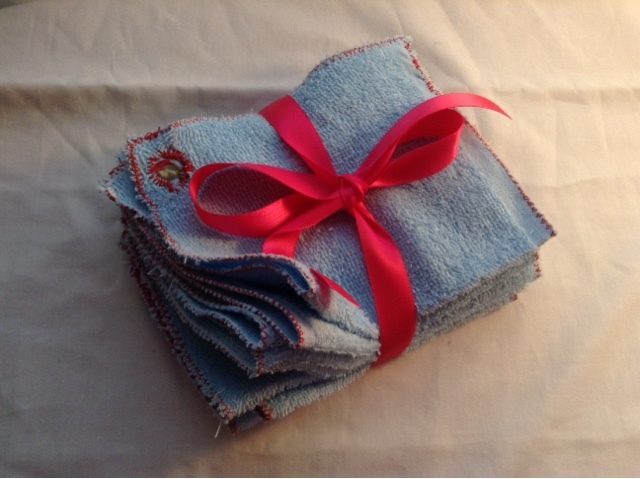 Make projects small enough so they are not time-consuming, and make sure you have sewn for your family members and treated them as the most special people in the world. Your children, husband, siblings and other family are first priority! One of the problems of the modern Christian women is to put the needs of family aside while they accomodate so many others. Family will be with you forever and you will regret not making them the special things you made for others. Your family is your first God-given "ministry" and the home is your "mission field." Cost: the terry cloth is about $12 a yard. A fourth yard makes 8 cloths. I get the cloth when it is on sale for half price. The ribbon is $1 for a spool of 3 yards, and thread is $2.50 a spool. Total: $2.16 for the gift. Your labour, however, is worth more than I can estimate, because this is a custom made gift. I do agree Lydia, that our family should be our first priority, and we should give our best to them, but there is a balance, because it is wonderful to share our gifts with others too. Our family should always be our priority in all things, and you are so right, that many today give their best to others, and just have little left to give to their family. Dorcas, if I remember correctly, you live sort of nearby. You are welcome to contact me if you are able to come to tea any time, or even ladies Bob,e class when we have a special get together. My email is on the side.